The Los Rios District lies directly across the railroad tracks from the Capistrano Depot and is the oldest neighborhood in California. The forty homes that remain here include three original adobe structures. The Montanez, the Rios, and the Silvas are all that remain of the adobes that housed the builders of the mission and the mission ranch workers in the late 1700's and early 1800's. 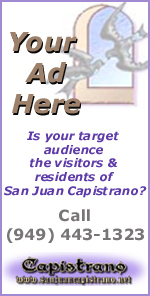 During these early years, as the Great Stone Church was being built, the mission was prospering as the center of the economy for the Spanish and the Acjachemen Indians who were beginning to merge their cultures. Many of the other homes here were built by European immigrants in the late 1800's and early 1900's. Today, although most of the homes are private residences, there are many businesses open to the public during business hours. This provides a relaxing and enchanting experience for locals and tourists alike. 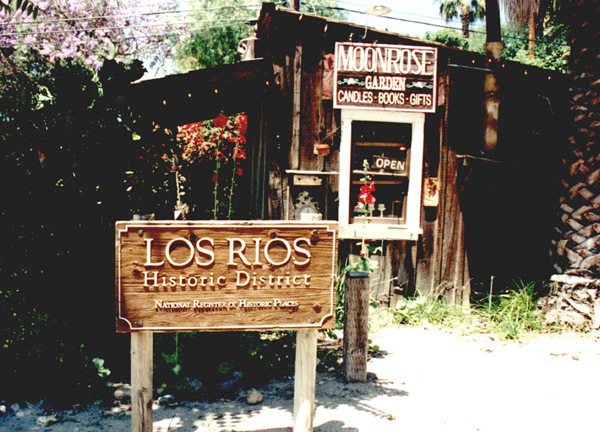 To walk the streets of the Los Rios District is to recapture the tranquillity of the slower pace of life that existed before the turn of the century and before. It was not long ago that the streets were still dirt. Willow trees grow among eucalyptus and palm. Cactus and wildflowers grow beneath sprays of bouganvia. You can hear the hum of insects that a writer in the 1800's wrote about and feel the haunting presence of those who lived in that time. As trains come in and out of the station, visitors cross the tracks to visit Zoomars Petting Zoo where children can ride the ponies and feed and pet rabbits, goats and other animals. Many come to Hummingbird Cottage to treat themselves to gifts, unusual collectibles or a soda. Other attractions include Apple Rose Cottage, Ramos House Cafe, The Tea House on Los Rios, Lemon Drop Grove (gifts shop), Ito Nursery and The O'Neill Museum where visitors can learn more about early California history as it all began here years ago. Come experience the beautiful Tea House on Los Rios in one of California's most unique and historic neighborhoods. Their handmade scones, loose teas and entrées are delicious and highly acclaimed. Specializing in special events - Baby and Bridal Showers, Garden Weddings, Birthday and Anniversary Parties. Hours- Wednesday through Friday 11-5, Saturday and Sunday 10-5. Closed Monday and Tuesday.